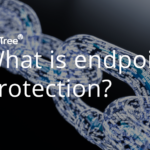 What is endpoint protection or security? In computer network security terms, endpoints are devices such as desktop computers, laptops, smartphones, tablets and printers used remotely or on site. They all link to the Internet and are the points from which you and your colleagues work and communicate. Endpoint protection or security is a system that protects these endpoints from the threats in cyberspace – the endpoints are the only places where threats can enter and operate.